Washington (CNN) – Most Republicans demanding to slash federal spending won't entertain the idea of taking a possible standoff with President Obama so far that the government shuts down. But the top Republican on the Senate Budget Committee told CNN Monday he's not ruling out that possibility "if the President just stonewalls – refuses to pass anything that will be responsible." In 1995, when Republicans controlled all of Congress and a spending stalemate resulted in a government shutdown, President Clinton went on to win re-election. Most Republicans remember that as a politically disastrous move they don't want to repeat. Sessions says there was an upside – the country's fiscal condition did get better. "It worked out good for the country. We had three years of balanced budgets that would never have happened had they not fought that hard in Congress so I think that Congress does have to fight," said Sessions. Sessions said he is worried that the "gulf" between what Republicans want in spending cuts and what President Obama will tolerate may be too hard to bridge. "It does appear that the president is a man of the left. He believes in government - he's still talking about it now – investments, which are spending programs," said Sessions. One of the first fights over spending will come over whether to raise the debt ceiling to avoid the U.S. from defaulting on its debt – now totaling more than $14 trillion. Many Republicans have said they will vote to do that only if the president agrees to cut spending. The Alabama Republican says he wants no less than a 10 percent across the board spending cut in exchange for his vote to raise the debt limit. "I truly believe that the debt limit is one of those points in which it will require the administration to meet with Congress and ask and answer the question of how we can continue at this rate, what changes can we make," said Sessions. House Republican leaders have pledged to cut spending back to 2008 levels by the end of this year, which they now say adds up to $50 or $60 billion. Sessions also told CNN he likes an idea proposed by House conservatives in the so-called Republican Study Group to go well beyond that - cut spending back to 2006 levels, which they say adds up to $2.5 trillion in savings over 10 years. 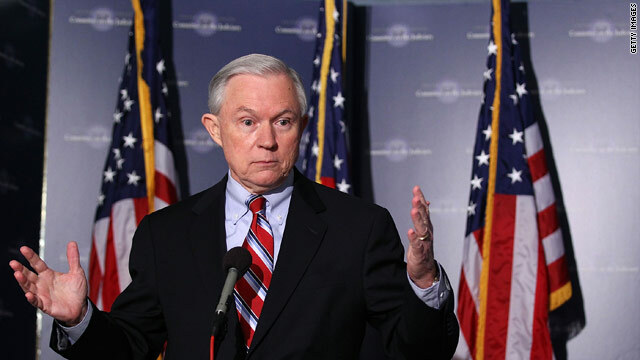 "Yes to go back to 2006 levels, that's just four years ago," said Sessions. "The country isn't going to sink into the ocean if we reduce spending that much. That would make a significant difference in our deficits, sending a message to the world that we're serious and I think create more confidence in our economic growth." To be honest, THAT would be way too beautiful to see, a win/win situation to everybody and the first time in years that this guy (who was suspiciously silent during the Bush unfunded years) said something right. That's not the way to accomplish your words (or wishes) Mr. Sessions. Don't back down. The American people gave a very very strong message last November. We're sick and tired of all the fat in government. We are sick and tired of all these entitlements that the hard working tax payer has to fund, while 47% don't pay taxes. We're sick and tired of the freebies to all the illegal aliens. We've had enough. We're broke and both parties got us to where we are today...so don't back down Republicans and do what you've been hired to do, but haven't done for a very long time. CUT GOVERNMENT SPENDING and stop milking the hard working tax payer dry. Why don't we wait and see what these tough talking republican weasels come up with in the way of budget cuts. They always talk a good story but when it comes time to back it up they always come up with an excuse to bail. Sessions is a particularly devious weasel. Great go ahead and shut down the government it worked so well for the republicans last time and we'll get 4 more years. I can't wait until the seniors start singing and the republicans start balking. Does the Party of No realize what that would do to public confidence after their attempt to destroy America during the 8 years of bush. The stock market is finally improving for all Americans and these nuts say this! What idiots some of you elected in November! I am sure it will be productive to shut down the government, It was a bad idea before and a bad political move now. Whether the Senator likes it or not shutting down the government is a poor excuse for the lack of bipartisan effort to keep spending in check. Remember how the Republicans shut down the government under Clinton. They took a big hit at the ballot box and rightfully so. Contrary to what Senator Sessions believes, not everyone in Alabama believes he walks on water. The Republicans won a majority in the House in 2010. They did not win the Senate or the Presidency. They are NOT as GWB used to say "the deciders". Senator Sessions should reconsider his reckless plan of action. If not, during the next election he should be fired for being completely irresponsible and not fit to serve or represent the people of Alabama in the US Senate. The GOP ain't got nothing in its game plan except throwing tantrums. Nothing. Shut Down The Goverment Republicans!! The military and the Federal workers dare you! !